Much of the expressive power of array-oriented languages such as Iverson’s APL and J comes from their implicit lifting of scalar operations to act on higher-ranked data, for example to add a value to each element of a vector, or to add two compatible matrices pointwise. It is considered a shape error to attempt to combine arguments of incompatible shape, such as a 3-vector with a 4-vector. APL and J are dynamically typed, so such shape errors are caught only at run-time. Recent work by Slepak et al. develops a custom type system for an array-oriented language, statically ruling out such errors. 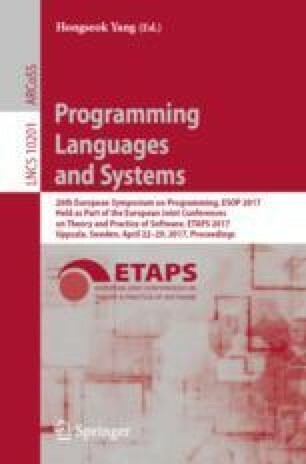 We show here that such a custom language design is unnecessary: the requisite compatibility checks can already be captured in modern expressive type systems, as found for example in Haskell; moreover, generative type-driven programming can exploit that static type information constructively to automatically induce the appropriate liftings. We show also that the structure of multi-dimensional data is inherently a matter of Naperian applicative functors—lax monoidal functors, with strength, commutative up to isomorphism under composition—that also support traversal. This paper has benefitted from helpful suggestions from Tim Zakian, Matthew Pickering, Sam Lindley, Andres Löh, Wouter Swierstra, Conor McBride, Simon Peyton Jones, the participants at IFIP WG2.1 Meeting #74 and WG2.11 Meeting #16, and the anonymous reviewers, to all of whom I am very grateful. The work was partially supported by EPSRC grant EP/K020919/1 on A Theory of Least Change for Bidirectional Transformations.